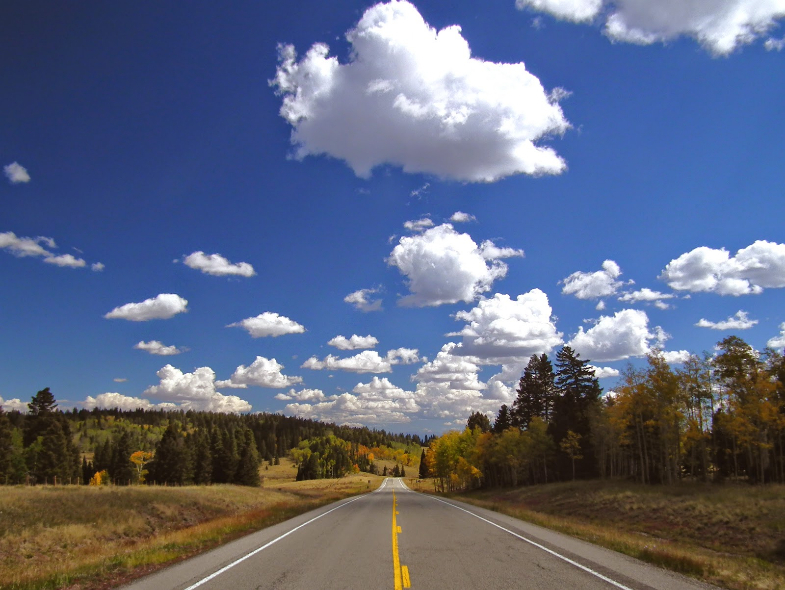 U.S. 64 from Tierra Amarilla to Tres Piedras N.M.
There’s no better time than the fall to enjoy some of the best scenery in northern New Mexico and with the changing of the leaves there’s no better excuse for a road trip. 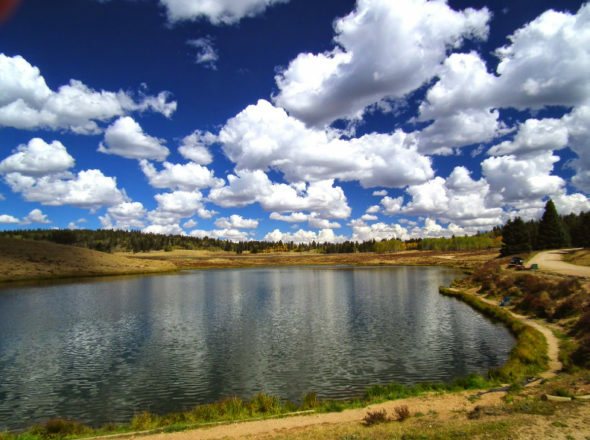 One of the easiest and best day drives up north to see the colors is the 50-mile jaunt from Tierra Amarilla (TA) over the mountains and through the Carson National Forest to Tres Piedras (TP). Those traveling from Santa Fe will see over 90 miles of spectacular scenery just getting to the outskirts of the historic village of TA and the turnoff to TP on US 64. Then after crossing the mountains it’s a mere 80 miles back from Tres Piedras passing through even more rural, sparsely settled and very scenic countryside. Travelers from Santa Fe heading north on U.S. 84/285 can choose either route just north of Espanola at the turnoff to Ojo Caliente to make the roundtrip drive. 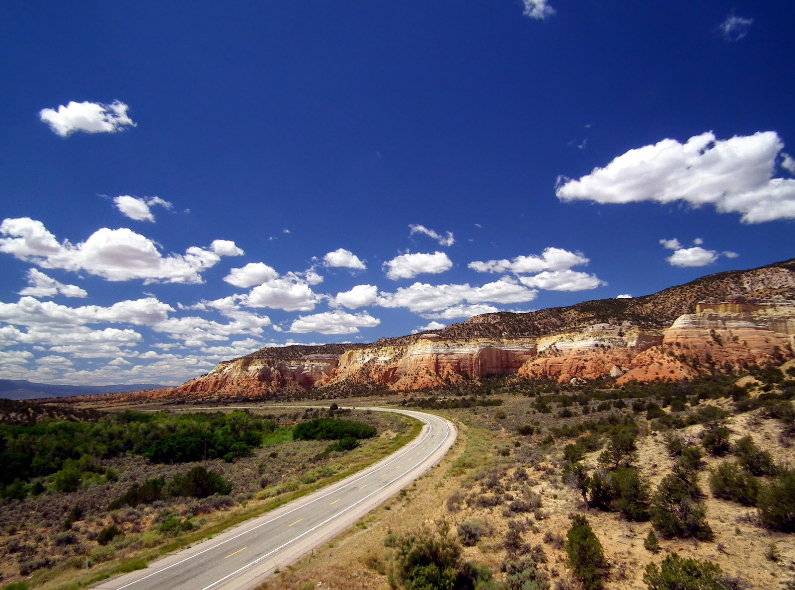 Those staying on U.S. 84 will pass through the tiny village of Abiquiu where the renowned artist Georgia O’Keeffe once lived and worked. 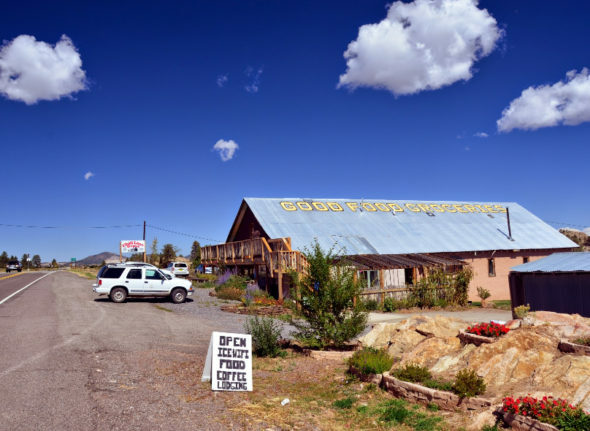 This is a great place to stop at Bode’s general store for gas, coffee and breakfast burritos . Continuing on northward along the Chama River motorists will climb atop a mesa where those who stop will be rewarded with great views of the river below, especially if the cottonwood trees are turning. 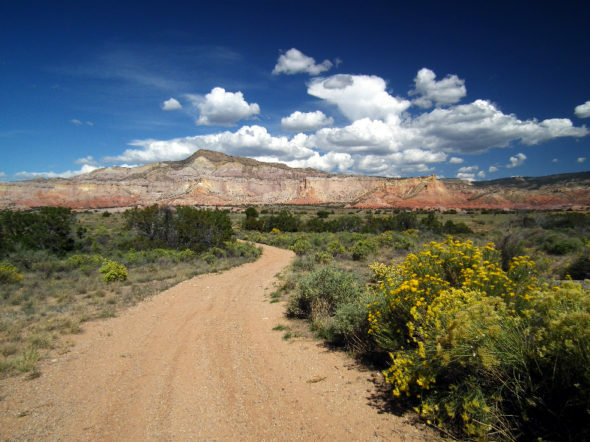 Continuing on this drive travelers will find themselves passing through a canyon fringed by towering red rock cliffs before coming upon the entrances to Ghost Ranch and Echo Amphitheater. 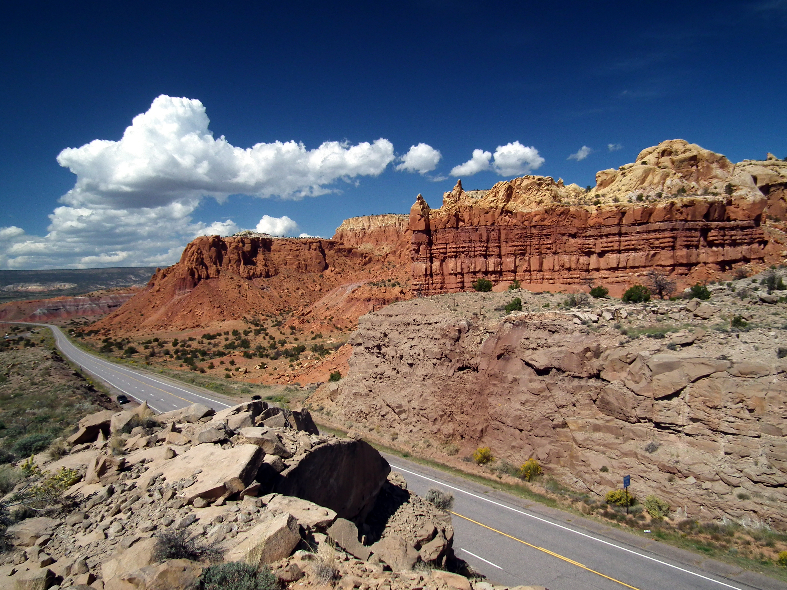 Red Rock Canyon on U.S. 84 at Abiquiu Lake. 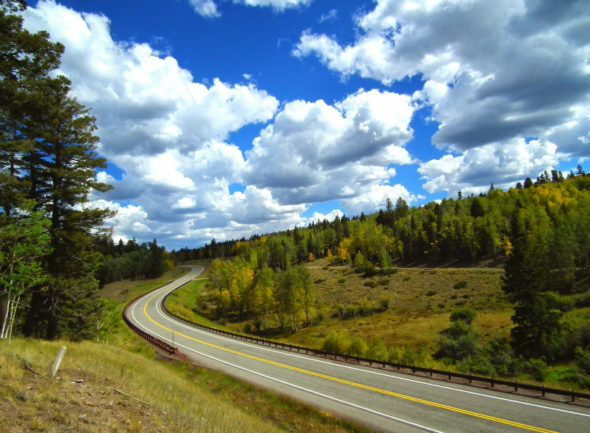 Stopping along this stretch of road and can produce lasting memories especially for those who are armed with cameras. Scenic view at Ghost Ranch. 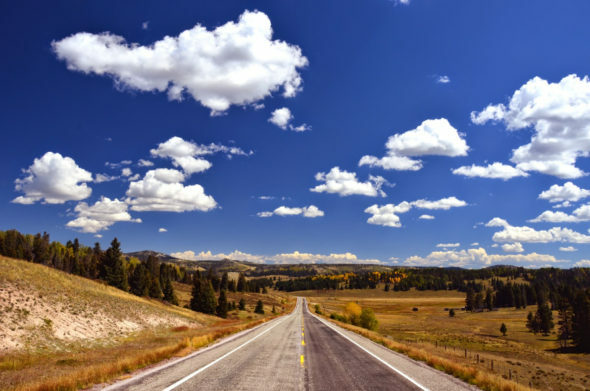 This may be one of New Mexico’s finest drives for those seeking magnificent, eye popping views of northern New Mexico’s high desert scenery. Echo Amphitheater on U.S. 84. 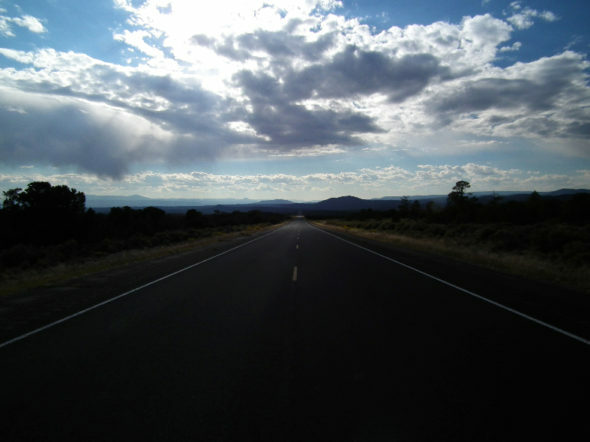 The drive then takes visitors further north for many miles through rugged countryside before coming to the US 64 turnoff just shy of Rio Arriba’s county seat at Tierra Amarilla. The highway over the mountains toTres Piedras first passes through a wide valley marked by farms and ranches before climbing towards the looming Brazos Cliffs. Heading into the mountains on U.S. 64 from the historic village of Tierra Amarilla. Several pull offs on this side of the mountains provide spectacular views of the countryside including bright yellow aspen groves and brilliant red oak trees during the fall. Upon topping out motorists will find two pull offs where they can view the imposing Brazos Cliffs and see even more striking views of the valley below. Brazos Cliffs off U.S. 64 between Tres Piedras and Tierra Amarilla. Upon continuing down the road motorists will find several opportunities to further explore the woods and fields of this vast tract of public land by way of forest roads. Those who like to fish will come across beautiful Hopewell Lake just off the highway where brook, rainbow and cutthroat trout can be caught. Hopewell Lake off U.S. 64 between Tres Piedras and Tierra Amarilla. There’s also nice little campground here and it’s a great place for a picnic or hike. More adventuresome types armed with a keen sense of direction or a Carson National Forest map could follow the forest road past the campground and end up hours later coming out by the hot springs at Ojo Caliente. Those who stay on the highway instead will end up at the roadside settlement of Tres Piedras on US 285. Heading down to Tres Piedras on U.S. 64. 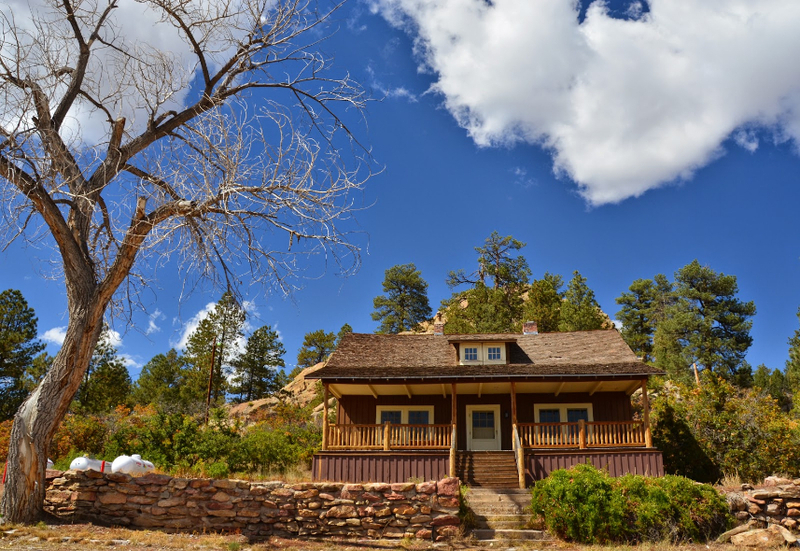 Travelers that stop in T res Piedras can see the preserved U.S.Forest Service home that Aldo Leopold built while serving as District Ranger there in 1911. 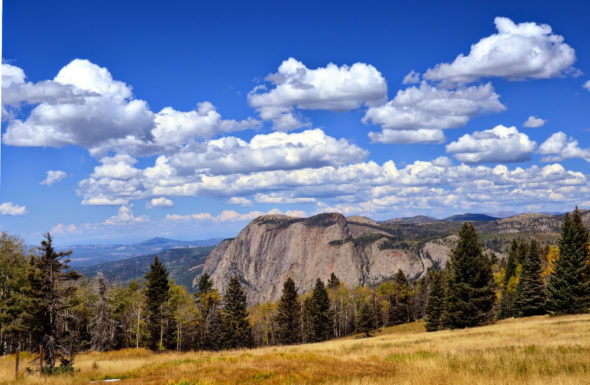 Leopold is considered by many to be the father of the nation’s wilderness conservation movement and New Mexico lays claim to being home to the nation’s very first designated wilderness area. The cabin Aldo Leopold built at Tres Piedras. Tres Piedras sits at a crossroads where until just a few years ago a busy gas station, convenience store and diner could be found. Now they stand unused and closed like so many other roadside businesses in New Mexico these days. 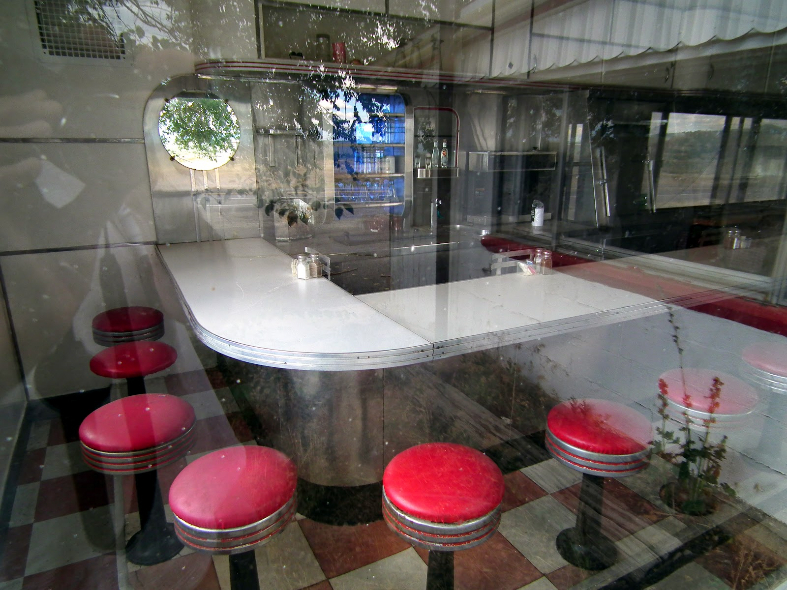 The old diner at Tres Piedras. But just within spitting distance sits a new business that’s recently opened to fill the void. The Chili Line Depot brews up some good coffee and serves great home cooking for those travelling through this remote area along the rim of the Rio Grande. The new diner at Tres Piedras, the Chile Line Depot, provides great food and service to travelers. Heading back to Santa Fe on US 285 is a breeze along the newly improved highway that rolls south for mile after mile through lonely, desolate range land until reaching Ojo Caliente.